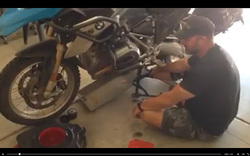 Instructional video: Jason Houle demonstrates the simplicity of an oil change with the BDCW skid plate. Instructional video: How to install BDCW footpegs on your KTM. 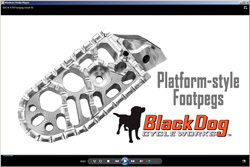 This is an instructional video that shows how to install Black Dog Cycle Works' platform-style footpegs on the big enduro KTMs. BDCW footpegs provide you with more control and comfort—like adding power steering to your bike. See our BDCW Footpeg Application Chart for the models to fit your bike. Size comparison chart of the BDCW platform-style footpeg against the stock versions of the BMW GS bikes. Very informative! 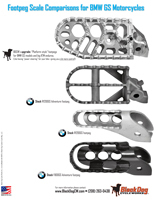 BDCW’s footpegs are available for BMW GS-series, KTM’s big enduros and also fit some other makes and models.